TORONTO, ON--(Marketwired - April 27, 2017) - Wesdome Gold Mines Ltd. (TSX: WDO) ("Wesdome" or the "Company") is pleased to update drilling results from its Eagle River and Mishi gold mines, Wawa, Ontario. Detailed results are compiled in Table 1 and illustrated in Figure 1. The 300 Zone is a recently recognized structure located 300-400 metres north of the main 8 Zone structure which has provided the bulk of the Eagle River Mines' production over the last 20 years. It consists of 2 areas, 300W and 300E (Figure 1). The 300W area is typified by a steeply dipping, tabular, shear hosted quartz vein. These zones remain open. As we develop these areas and confirm their dimensions, grade and continuity, we are gaining confidence in their potential to significantly contribute to Eagle River's production and mine life. Mr. Duncan Middlemiss, President and CEO commented, "These results bode well for diversifying production locations above existing development. Recent success in both the 300E and 300W areas enhance opportunities to bring above average grades into the mine sequence over the short to medium term." Drilling commenced in January, 2017, with 2 drills. The purpose of the drilling is to define and delineate potential resources 600 metres and 1,700 metres west of current open pit mining operations (Figure 2). Drilling to date is summarized in Table 2 and illustrated in Figure 2. Mr. Middlemiss concluded, "We are aggressively drilling an additional 1.5 kilometre length of the Mishi gold deposit. The purpose of the drill program is to expand resources, and results will enable us to assess long term growth potential at the Eagle River Complex." Mineralization at Mishi consists of a series of tabular sericite-ankerite alteration zones carrying fine disseminated pyrite and 10% smokey quartz veinlets and lenses. It strikes east-west, dips 40 degrees north and follows a deformed regional volcanic-sedimentary rock contact. 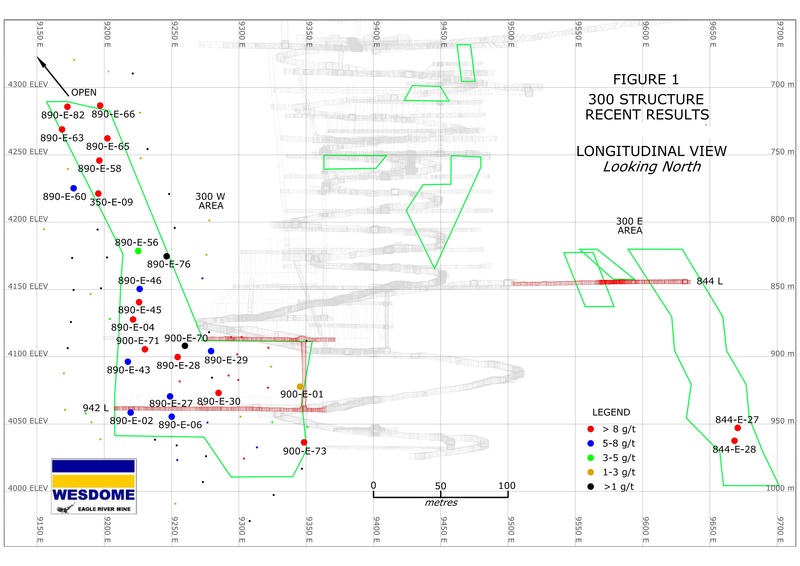 To date detailed drilling to assess resource potential has been completed over a 1.6 kilometre length. All assays are performed by fire assay on 25 gram aliquots at the Eagle River Mine assay office. Duplicates, replicates and blanks are routinely employed to monitor quality control. The technical content of this release has been compiled, reviewed and approved by George N. Mannard, P.Geo, Vice-President Exploration and "Qualified Person" as defined and required by National Instrument 43-101 "Standards of Disclosure". Wesdome Gold Mines is in its 30th year of continuous gold mining operations in Canada. The Company is 100% Canadian focused with a pipeline of projects in various stages of development. The Eagle River Complex in Wawa, Ontario is currently producing gold from two mines, the Eagle River Underground Mine and the Mishi Open pit, from a central mill. Wesdome is actively exploring its brownfields asset, the Kiena Complex in Val d'Or, Quebec. The Kiena Complex is a fully permitted former mine with a 930 metre shaft and 2,000 tonne per day mill. The Company has further upside at its Moss Lake gold deposit, located 100 kilometres west of Thunder Bay, Ontario, which is being explored and evaluated to be developed in the appropriate gold price environment. The Company has approximately 133 million shares issued and outstanding and trades on the Toronto Stock Exchange under the symbol "WDO." This news release contains "forward-looking information" which may include, but is not limited to, statements with respect to the future financial or operating performance of the Company and its projects. Often, but not always, forward-looking statements can be identified by the use of words such as "plans", "expects", "is expected", "budget", "scheduled", "estimates", "forecasts", "intends", "anticipates", or "believes" or variations (including negative variations) of such words and phrases, or state that certain actions, events or results "may", "could", "would", "might" or "will" be taken, occur or be achieved. Forward-looking statements involve known and unknown risks, uncertainties and other factors which may cause the actual results, performance or achievements of the Company to be materially different from any future results, performance or achievements expressed or implied by the forward-looking statements. Forward-looking statements contained herein are made as of the date of this press release and the Company disclaims any obligation to update any forward-looking statements, whether as a result of new information, future events or results or otherwise. There can be no assurance that forward-looking statements will prove to be accurate, as actual results and future events could differ materially from those anticipated in such statements. The Company undertakes no obligation to update forward-looking statements if circumstances, management's estimates or opinions should change, except as required by securities legislation. Accordingly, the reader is cautioned not to place undue reliance on forward-looking statements.